Chex Out My Big Guns - SOLD! Introducing our new Big Chex To Cash colt! He is absolutely beautiful! Good size too. Big Chex To Cash is an amazing reining, earning over $220,000. He was the 2005 NRHA Open Futurity Reserve Champion AND the 2007 NRHA Open Derby Reserve Champion. Dam is our good mare Montadocs Starlight. "Little Ricky" is FOR SALE. Asking $7500, payments accepted until weaning. We will keep this page updated as he grows. Starlights Irish Cat - SOLD! We welcome our newest horse addition, Lucy's 2010 foal. Bay filly, star, and one hind sock. This filly's sire has a LTE of $99,000 in NCHA monies, and is a full brother to Highbrow Cat. Montadocs Starlight, her dam, can be seen under 'Mares'. 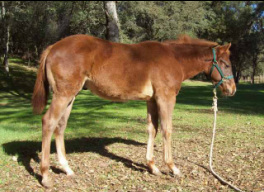 This filly is guaranteed HERDA N/N. She should make a very nice NCHA or NRCHA prospect. She is for sale for $4000 with special consideration to a show home.